Commando Comics is a comic series printed from 1942-1946 with a dominant war theme shown throughout most, if not all, of the stories. 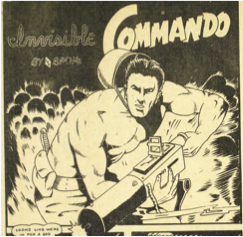 Commando Comics were the final of the Bell Features’ comic series. These comics are part of a collection called the Canadian Whites produced by Bell Features, a comic publishing company (Kocmarek 155). The front and back covers are produced in colour while the rest of the book is all in black and white. These comics were sold for $0.10 at the time they were printed, but today are worth significantly more than that due to how difficult they are to find in readable condition. In November 1944, volume 14 was printed and it is no exception to the war theme. There are 12 different black and white stories within the 48 pages all based around the war. Different individuals write a majority of the stories, and all contain different plots that always relate back to war. The Commando Comics were written during World War Two, this could explain the reason the comics were completely war-themed (Kocmarek 155). Adolescents and pre-adolescents of the time read these comics. The readers would have learned about the war through the different stories (Kocmarek 156). Although they were fictional, they still provided an insight to what it would have been like for the Canadian soldiers fighting against the enemies (Kocmarek 156). The comics were seen as the only source of information about war for the young age group because the newspapers were for an older audience, and television was no accessible as it is for the youth of today (Kocmarek 156-157). The stories and characters would have been seen as very interesting to the youth because the war took place in a foreign place and contained storylines of violence and sabotage (Kocmarek 157). However, it could have provided the youth with hope because the Canadians in the stories were always successful in their missions. This could have caused the youth to have stronger beliefs in what the Canadian soldiers despite the stories being fictitious. The Commando Comics were an important source of information for the younger generations during the time of war, because the medium they were presented in was easily accessible and easily understood (Kocmarek 156). These comics became the primary source of information about Canadian soldiers and the war for the youth. World War Two lasted from 1939 to 1945. The Second World War was an entirely new battlefield for many Canadian soldiers. It was different climate and terrain than what most of them had ever experienced (Sumner 53). The Canadians along with the British and Americans were a part of the Allies, which is the side that ended up winning the war. The Allies were battling against the Axis, which was the side of the Germans, and the Japanese. This war used many different types of battle including surface ships and U-boats, and air warfare (Sumner 54, 57). The armies, navies, and air forces were the three different types of soldiers found on each side in the war (Sumner 57). The civilian and military intelligence organizations had to work hard to ensure that they could fulfill the needs of these three groups. It was very important for the military to know how to position their soldiers in order to win the war (Sumner 62). In the end, the Allies planning and decisions seem to have been effective because they are the ones who won World War Two. In October of 1940, there was a newspaper article released in the Toronto Telegram called “Ottawa’s “Comic Capers” and Compulsory Service” about how comics were briefly used as way of training soldiers. The idea behind this was that the comics would have glorified the war instead of showing the harsh and brutal conditions the soldiers would be facing. This was supposed to appeal to young Canadians before beginning their 30 grueling days of preparing to defend Canada (Ottawa’s “Comic Capers”). However, this idea was not well received. It was seen as childish and offensive to recruits who were more intelligent and did not fit into the young Canadian demographic (Ottawa’s “Comic Capers”). However, it was soon decided that comics should be used as a form of entertainment where soldiers can be featured rather than a form of training for the soldiers who are going to go to war. Every story is related to war whether it is soldiers fighting the Japanese, soldiers fighting the Germans, or a proposed idea for war success. There is always war, and with war comes soldiers. The Canadian soldiers portrayed in Commando Comics are always the stronger and smarter ones, and this always leads them to victory. Although, different artists draw the soldiers they have a lot of similarities. The soldiers are all very masculine, young men in their mid-twenties who are well groomed, and basically the ideal soldier (Cord 50). The soldiers are always capable of getting themselves out of whatever trouble they are in, even when it seems impossible. The soldiers are drawn and presented in a way that positions them as smarter than the enemy and able to defeat them. Leo Bachle. Panel from “Invisible Commando.” Commando Comics, No. 14, November 1944, p. 26. Bell Features Collection, Library and Archives Canada. The image shown is from the opening image of “Invisible Commando” by Leo Bachle. Without explanation, or relevance to the rest of the storyline, the soldier is pictured shirtless. He is not only shirtless, but his muscles are well defined and he can be perceived as almost “Hulk-like”. He is extremely well groomed for someone who is at war with his helmet falling off his head revealing almost perfectly styled hair. He is holding a very large gun and aiming it out of the frame presumptively at an enemy. He looks like an ideal solider, and almost all the other soldiers are drawn with similar characteristics (most are wearing shirts, though). Canadian soldiers in World War Two looked much different than the soldiers presented in the comic books. Advertisements for the army included a man who looked to be about 25 years old dressed in full uniform (Hayes and Goodlet 46). This man has on shined boots along with spurs and jodhpurs, a tailed jacket with a belt over his right shoulder complete with a tightly knotted tie (Hayes and Goodlet 45). This is supposed to be what the ideal and most masculine soldier was to look like. The Canadian soldier was encouraged to always wear a proper uniform (Hayes and Goodlet 59). Realistically he wore what he could in order to survive the harsh conditions. A shirtless existence would not suffice. Masculinity is something that was almost enforced in the Canadian army during World War Two. The soldiers were meant to be as tough and “manly” as they possibly could be in order to be the best soldiers that they could be. The soldiers in the Canadian army were typically around mid-twenties, making them more likely to be young and carefree. They were carefree because when they enlisted, many had no dependents (Grace 341). The more experienced soldiers had three or four years of service, but lack experience in civilian life. A lot of the soldiers did not have a lot of education due to other priorities in their lives furthered by the fact that they were unable to access education or the poverty in some areas (Grace 341). The soldiers were not very connected with the current events of that time as they had little access to newspapers. The men were instead taught about different part of Canada, which provided them with more information about their country and places in it that they had not been to (Grace 342). This kept them busy while educating them about their homeland. 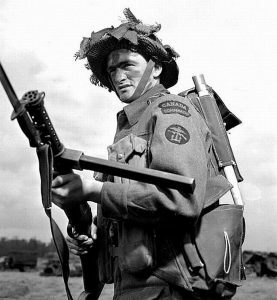 A Canadian paratrooper of the 1st Parachute Battalion. These 600 men were the first Canadians to land in France on the night of June 5-6. 84 were killed. Canada Alive! Juno Beach, 5 June 2014. Photo. https://canadaalive.wordpress.com/2014/06/05/juno-beach/. The image shown depicts a Canadian soldier holding a large gun. He is said to be a Canadian paratrooper of the 1st Parachute Battalion, one of the first Canadians to land in France (Canada Alive!). He is wearing a full uniform, with a helmet on his head, and is not well groomed. Compared to the soldier presented in the Commando Comics, he looks prepared for war. Many popular superheroes today came from American comic books, such as “Batman”, “Superman”, and the “Green Lantern” (Cord 28). However, these were not the only hero type seen in comics. Soldiers were viewed as heroes in many comic books, including American ones. Many of the American comics, similar to the Canadian ones had the main characters (soldiers) fighting and winning against various countries that were a part of the Axis. The comic soldiers lived easy lives where every situation had a doable solution despite the fact they were supposed to be living in a warzone. The comics allowed everyone to feel as though they were a part of war through the stories being told. The comics were seen as truth, allowing children to identify different aspects of the war such as the weapons, uniforms, and language (Cord 48). The men were drawn as what one might the ideal soldier to look like complete with “handsome chiselled features, broad shoulders, and a superior knowledge of science and technology” (Cord 50). This is a very specific way that the soldiers were drawn, and is applicable to the Canadian comic soldiers as well. The main difference between the comic soldiers and real soldiers seems to be the way that they look physically. Comic soldiers are always very muscular, well groomed, and not always dressed in the most war appropriate clothing (Cord 50). The Canadian soldiers do not have to be muscular, but they must be well trained. They are not as well groomed because it is real life war and looking the best that they can was definitely not a priority. They were dressed in ways that someone who is fighting a war should be. They tended to have the appropriate gear and weapons that they would need to survive as long as possible. A similarity between the two types of soldiers is how they were perceived as masculine and manly. This was something that was highlighted not only in the comics, but also through many different types of media concerning Canadian soldiers. Soldiers seem to have been described simultaneous as soldiers and masculine (Shaw 24). No soldiers were described as weak or scrawny despite the unavoidable fact there were definitely some who were not as masculine as others. Masculinity seems to have been not only important to the comic soldiers, but also very important to the real Canadian soldiers. The Commando Comics portray soldiers in a very specific way, even though all are drawn differently. The main idea of the soldier stays the same. They are muscular, handsome, smart, young men. They are the ideal people who one would have wanted to be protecting their country. The soldiers are usually holding weapons and come with an infallible plan about how to defeat the enemy. They are wearing significantly less gear and protection than they should be during war, but that usually does not matter since they do not get injured. The soldiers in the comics can be seen as the perfect soldier. When the comic soldier is compared to the real Canadian soldier, the differences and similarities are obvious. However, both type of soldier (comic and real) can be seen as heroes in society. The soldiers in the comics always beat the enemy or save someone in distress. Real soldiers are fighting for Canada and freedom. It is important to understand the difference between the two soldiers because one is a reality while the other is not. The comic readers were almost being led to believe that Canadian soldiers were undefeatable, yet in reality they lived in harsh conditions and were fighting for their lives. The comics seem to show the soldiers going through minimal struggles to win, and always having the perfect equipment. World War Two was nothing like this; it was hard work and a lot of it. Although, the comics were aimed at the youth, it would still be beneficial for them to understand how hard the Canadian soldiers were working, and that it was not as easy as it is portrayed in the Commando Comics. Soldiers are important to the comics and even more important to Canada. Through looking at the comic and real soldiers, they can both be seen to be significant to Canadian society. Without the comic soldiers, the contemporary youth would not have been able to learn about World War Two and how hard it was and how vital soldiers were to it. Without real soldiers, there would be nobody protecting Canada or keeping the peace, as Canadian soldiers are typically known to do. Soldiers show how their role in society is one that needs to be appreciated and understood through everything that they are able to accomplish through their enlistment or through their comic stories. A Canadian paratrooper of the 1st Parachute Battalion. These 600 men were the first Canadians to land in France on the night of June 5-6. 84 were killed. Canada Alive! Juno Beach, 5 June 2014. Photo. https://canadaalive.wordpress.com/2014/06/05/juno-beach/. Accessed 23 March 2017. Commando Comics, no. 14, November, 1944, pp. 1-36. Bell Feature Collection, Library and Archives Canada. http://data2.collectionscanada.gc.ca/e/e447/e011166543.pdf Accessed 23 March 2017. Grace, John. “The Canadian Soldier and the Study of Current Affairs.” International Affairs (Royal Institute of International Affairs 1944-), vol. 20, no. 3, 1944, pp. 341–46. www.jstor.org/stable/3018560. Accessed 23 March 2017. Hayes, Geoffrey. & Goodlet, Kirk. W. “Exploring Masculinity in the Canadian Army Officer Corps, 1939-45.” Journal of Canadian Studies/Revue d’études canadiennes, vol. 48 no. 2, 2014, pp. 40-69. Project MUSE, muse.jhu.edu/article/553724. Accessed 23 March 2017. Kocmarek, Ivan. “Truth, Justice, and the Canadian Way: The War-Time Comics of Bell Features Publications.” Canadian Review of Comparative Literature/Revue Canadienne de Littérature Comparée, vol. 43, no. 1, March 2016, pp. 148–65. Project Muse, https://muse-jhu-edu.ezproxy.lib.ryerson.ca/article/611725/pdf. Accessed 23 March 2017. “Ottawa’s “Comic Capers” and Compulsory Service.” Toronto Telegram, 16 Oct. 1940, http://collections.civilisations.ca/warclip/objects/common/webmedia.php?irn=5033495. Accessed 23 March 2017. Scott, Cord A. Comics and conflict: War and patriotically themed comics in American cultural history from World War II through the Iraq War. 2011, p. 45-51. Shaw, Amy. “Conscientious objection in Manitoba during the First World War.” Manitoba History, no. 82, 2016, pp. 22-27. Academic OneFile, go.galegroup.com/ps/i.do?p=AONE&sw=w&u=rpu_main&v=2.1&id=GALE%7CA472267142&it=r&asid=2060d32bf59ca8f8407fbf426a701534. Accessed 23 March 2017. Sumner, Lori. “Know Your Ground: A Look at Military Geographic Intelligence and Planning in the Second World War.” Canadian Military Journal, vol. 14, no. 3, 2014, pp. 53-63. Accessed 23 March 2017.